Crowd licenses are based on the number of end-users who will log in to the applications that are integrated with Crowd. You can obtain an evaluation license from the Atlassian website. When you obtain an evaluation license — or purchase, renew or upgrade your license — you will receive a license key via email or on the Atlassian website. You will need to enter your license key into your Crowd server as described below. Click 'Licensing' in the left-hand menu. Type (or paste) your license key into the 'License Key' field. It is important to avoid exceeding the license limit, because once the user limit has been exceeded, no one can log in (including administrators). Enter a 30-day evaluation license key. (Create one here.) The 30-day evaluation key lets an unlimited number of users sign in during the trial period. You can use the 30 days to clean up the users in the system or purchase a license key for a higher user count. If you have more than one directory, ensure that the same user does not exist in multiple directories. We recommend that you allow only particular groups to log in to each application, rather than entire directories. Note that a mapped application can 'see' all users in a directory, even if not all of them can log in to the application. For example, a Human Resources application might be mapped to your entire Active Directory server, but only the HR group is allowed to log in to the application. The Licensing screen shows the number of users who currently count towards your license. This total is updated automatically at regular intervals. If you have recently added or removed users, the total may not be up to date when you view the screen. You can update the count immediately, as described below. In the top navigation bar, select the Administration tab. In the left-hand menu, click Licensing. Click the link labeled Recalculate your user total. The recalculation may take a while, depending on the size of your user base. Once the calculation is ready, you will be able to see the license count, list of users (and the directories those users are from) in log files. Your License Server ID is generated automatically, based on your license key. The Support Entitlement Number will appear only on newer licenses. If your License Server ID starts with a 'B', you should also have a Support Entitlement Number. 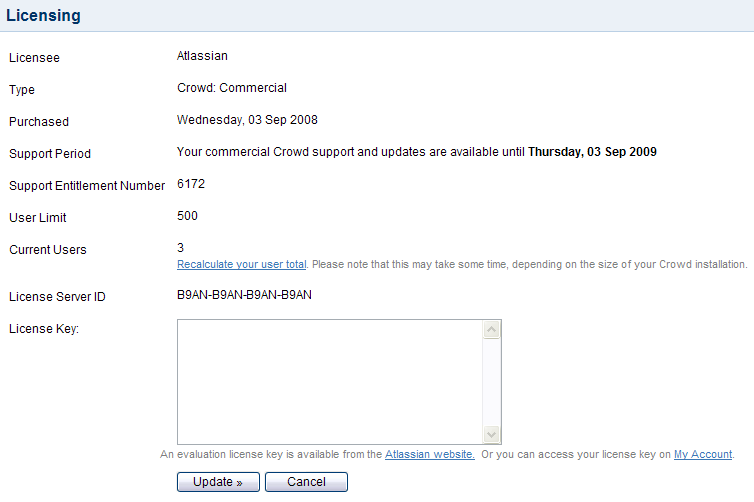 This number is not currently used, but will be used by Atlassian Support in the future.